bThe Russell H. Morgan Department of Radiology and Radiological Science (D.M.Y. ), Neuroradiology Division, Johns Hopkins Hospital, Baltimore, Maryland. SUMMARY: The pathogenesis of multiple sclerosis is characterized by a cascade of pathobiologic events, ranging from focal lymphocytic infiltration and microglia activation to demyelination and axonal degeneration. MS has several of the hallmarks of an inflammatory autoimmune disorder, including breakdown of the BBB. Gadolinium-enhanced MR imaging is currently the reference standard to detect active inflammatory lesions in MS. Knowledge of the patterns and mechanisms of contrast enhancement is vital to limit the radiologic differential diagnosis in the staging and evaluation of MS lesion activity. 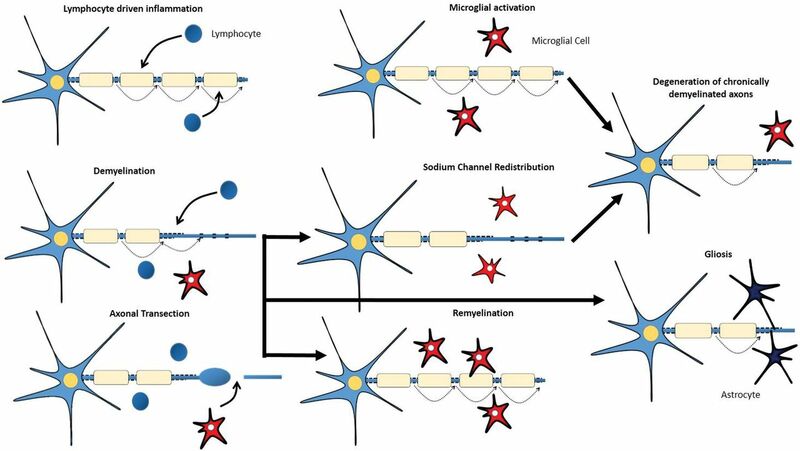 The aim of this review was the following: 1) to outline the pathophysiology of the effect of lymphocyte-driven inflammation in MS, 2) to describe the effects of gadolinium on the BBB and glymphatic system, and 3) to describe gadolinium enhancement patterns and artifacts that can mimic lesions in MS.
MR imaging is used as paraclinical supporting evidence of MS and has become an established tool for disease monitoring.1 It is used to guide treatment by identifying poor responders during follow-up of lesions in the white matter tracts and gray matter,2 which is important given that MS is a chronic disease. Technically, challenges remain in standardizing MR imaging scanner and contrast media protocols to better characterize and follow lesions during disease progression. Gadolinium enhancement is used to depict the early inflammatory phase of MS lesions, which is primarily dependent on 2 key conditions: First, there must be sufficient inflammation surrounding the MS lesion, and, second, the time lapse between gadolinium (Gd3+) injection and image acquisition allows the Gd3+ molecule to traverse the disrupted BBB and glymphatic system into the lesions (See On-line Appendix for more on Gadolinium enhancement).3 The aim of this review was the following: 1) to outline the pathophysiology of lymphocyte-driven inflammation in MS, 2) to describe the effects of Gd3+ on the BBB and glymphatic system, and 3) to describe Gd3+ enhancement patterns and artifacts that can obscure the detection of MS plaques. At the early stages of MS, acute plaques are a common finding. They typically consist of robust inflammatory infiltration with demyelination throughout the lesion.5 The inflammatory components at this stage are mainly T-lymphocytes, monocytes, and macrophages, and their influx is centered around vessels (perivascular cuffing). Foamy macrophages can also be found distributed throughout the lesion because they contribute to active stripping of myelin from axons.4 Even though the axon itself is usually spared, it is common to find extensive axonal injury in these lesions, and despite prominent glial reactivity, dense glial scarring is not typical. When MS plaques become chronic, the lesions are predominantly hypocellular with obvious glial scarring and loss of myelin. The pathogenesis of MS is still a poorly understood mechanism. One hypothesis states that the initial event during plaque genesis is an early intrinsic oligodendrocyte injury that leads to the inflammatory damage associated with MS. This hypothesis seems to be supported, to a certain extent, by a study7 that found that the tissue immediately adjacent to lesion borders showed microscopic evidence of cellular injury without the presence of immune infiltration. It is well-established is that MS is an immune-mediated destruction of CNS components. The presence of lymphocytes in MS suggests an antigen-specific targeting of myelin in this disease. T-cells isolated from patients with MS have been shown to react to a variety of antigens of myelin origin like myelin basic protein, proteolipid protein, myelin oligodendrocyte glycoprotein, and myelin oligodendrocytic basic protein.8⇓⇓⇓–12 In addition, many nonmyelin antigens and neuronal antigens have also been described. The exact mechanism causing the T-cells to become abnormally activated is still elusive, but molecular mimicry has been suspected. Another culprit is interleukin 17. Interleukin 17-secreting cells were found in the CSF of a patient with MS,13 and the percentage of interleukin 17 producing memory CD4 T-cells was elevated in the peripheral blood of patients with MS.14 Interleukin 17 gene expression is also elevated in lesions of patients with MS, thus suggesting a high association between this interleukin and MS pathogenesis, especially with the lymphocyte T helper 17 being a critical mediator of the immune destruction of myelin and axons in MS.15 In addition, T helper 17 cells have been shown to cross the BBB more efficiently than other T-cells, and the presence of interleukin 17–secreting CD4 T-cells has been shown to be capable of causing damage to the BBB,16 which contributes to the influx of inflammatory cells into the brain. In response to inflammation, injury, and axonal degeneration, microglial cells, which represent the macrophages resident in the CNS parenchyma, become activated.17 When activated, these microglial cells can adopt diverse phenotypes, which can be benign, protective, or contributory to neurodegeneration (Fig 1).18,19 The pathogenesis of MS is characterized by not only lymphocyte-driven inflammation and microglial activation but also demyelination, remyelination, axonal degeneration, and gliotic response. Lymphocyte-driven inflammation induces conduction blocks in structurally intact axons, drives demyelination, and induces transection of axons (with consequent conduction block) within acute lesions. Activated microglial cells might contribute to the repair mechanisms that lead to remyelination or to the degeneration of axons. Redistribution of sodium channels along demyelinated axons could restore conduction. Astrocytic activation and proliferation (gliosis) might impede repair. Axonal Degeneration and Neuronal Damage. 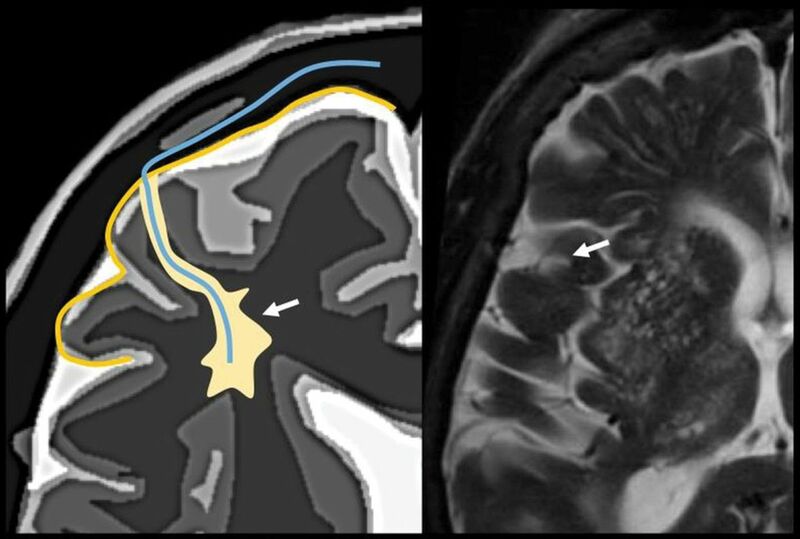 T2-weighted sequences, whether true T2-weighted or FLAIR sequences, are useful for identifying the number and size of WM lesions, but often they cannot determine the activity level of a plaque in and of itself.28 T1-weighted imaging without contrast helps detect late MS lesions that appear hypointense on MR imaging and demonstrate irreversible axonal pathology.28 T1-weighted sequences with Gd3+ detect BBB breakdown, which occurs with active inflammation. The current diagnostic criteria of MS are based on the detection of CNS lesions demonstrating dissemination in space and time. Several criteria aim to quantify the parameters involved in the dissemination in space and time. The 2005 McDonald criteria reported a sensitivity and specificity of 77% and 90%, respectively.29 The newly revised 2010 McDonald criteria demonstrated sensitivity and specificity of 100% and 86%, respectively, for children older than 11 years of age with symptoms inconsistent with acute disseminated encephalomyelitis.30 The Swanton criteria for dissemination in space reported a sensitivity and specificity of 71% and 86%, respectively.31 In Europe, radiologists have adopted the Magnetic Resonance Imaging in MS modification with the following changes: 1) Optic neuritis is added to 4 locations in McDonald criteria, 2) ≥3 periventricular lesions are required, 3) cortical and juxtacortical lesions are considered qualifying, and 4) dissemination in time does not need to be asymptomatic or symptomatic, and any new lesion or enhancing/nonenhancing lesions in the same study qualify. Gadolinium distribution into the neural tissue is complex because it occurs by a variety of mechanisms. To ensure adequate oxygen delivery to the highly metabolically active neurons, the capillary network of the brain is dense. A unique distinguishing feature of the brain microvasculature is the presence of tight junctions between the adjacent endothelial cells lining the capillaries. The BBB exists at all levels of the vascular tree within the CNS, including the penetrating arteries and arterioles, the dense capillary bed, the postcapillary venules, and the draining venules and veins.32,33 Although each vascular segment needs to maintain tight barrier properties to insulate the neural tissue from the blood, there are specializations within the vascular bed that are crucial for BBB function. 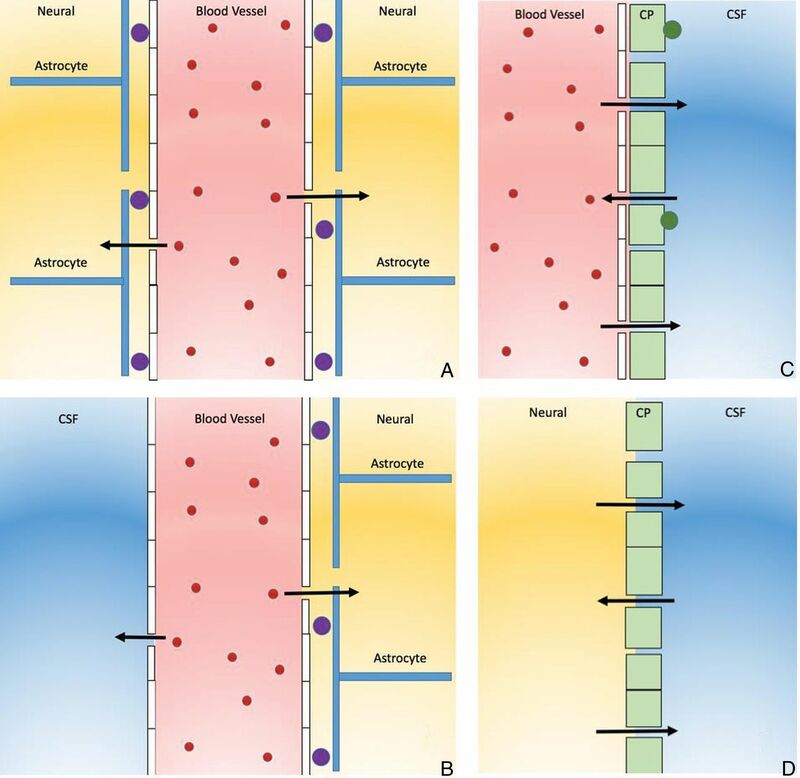 The 4 main interfaces of the blood-brain barrier. A, The blood-brain barrier proper is formed by tight junctions between the endothelial cells of the cerebral vasculature. It is thought that pericytes (purple circles) are sufficient to induce some barrier characteristics in endothelial cells, while astrocytes are able to maintain the integrity of the blood-brain barrier postnatally. B, The outer CSF-brain barrier and the level of the pia arachnoid are formed by tight junctions between endothelial cells of the arachnoid vessels. C, The blood-CSF barrier is formed by tight junctions between epithelial cells of the choroid plexus (CP) (note that the plexus vasculature is fenestrated). Resident epiplexus (green circles) immune cells are present on the CSF-surface of the plexus epithelium. D, The inner CSF-brain barrier, present only in early development, is formed by strap junctions between the neuroependymal cells lining the ventricular surfaces. In the adult, this barrier is no longer present. Blood supply to both WM and GM occurs with the primary vessels crossing the pia mater into the GM. However, in patients with MS, capillary density is relatively maintained, but with decreased cerebral blood flow resulting from numerous string vessels.34 String vessels are thin connective tissue strands, remnants of capillaries, with no endothelial cells, because they do not carry blood. Whether string vessels are the cause or effect of GM hypoperfusion and eventual brain atrophy is unknown. Another potential hypothesis is that inflammatory processes can result in microvascular damage by different mechanisms: Cytotoxic T-cells may recognize antigens on endothelial cells and activate a clotting cascade, which, in turn, leads to thrombosis.35 Additionally, evidence36 suggests that parenchymal plaques may initially be associated with capillaries and arterioles in an attempt to seal microvascular leakage, especially during inflammation. Finally, in advanced stages of inflammation, the pressure exerted by the growing perivascular amyloid deposits constricts the microvessel, leaving dysfunctional capillary stumps and string vessels. The clearance of excess metabolites is essential for tissue homeostasis41 and is meditated by the CSF-interstitial fluid exchange pathway. Furthermore, studies on rodent brains have demonstrated that the primary, most rapid glymphatic inflow occurs at the level of the hypothalamus, olfactory tract, retrosplenial cortex, pons, amygdala, cerebellum, and hippocampus.43 The glymphatic system is also dependent on the intensity by which the pulse is generated throughout the smooth-muscle cells of the arteries. Particular to arteries, pulsation that is often generated by smooth-muscle cells creates pulse waves along the whole length of the pial artery and penetrating arteries diving into the brain from the cortical surface.38,44 It has been shown that adrenergic agonists such as dobutamine increase the pulsatile effect significantly when administered to mice and result in a larger amount of CSF penetration into the parenchyma.32,41 The opposite effect was obtained when arterial pulsatility was dampened by internal carotid artery ligation. Additionally, the reduction of pulse waves decreased CSF-interstitial fluid exchange.38 This feature suggests that glymphatic activity, at least in part, is driven by arterial pulsatility and explains why perivascular influx occurs preferentially around pulsating arteries and not cerebral veins. The impact of double and triple doses of Gd3+ has been investigated to determine lesion activity and active plaque numbers. Gasperini et al48 compared the number and volume of MS lesions when the patient was administered double and triple doses of gadolinium. The volume of lesion enhancement with a triple dose was higher compared with the double dose (1.9 versus 1.7 mL). However, they concluded that the double dose provided similar sensitivity with lower cost and improved safety than triple dose studies for MS detection. Additionally, in a recent study,49 it was concluded that macrocyclic Gd3+ deposition is reduced but not completely eliminated when macrocyclic Gd3+ is used compared with linear agents. Thus, in light of the previous studies, double and triple doses of Gd3+ pose greater risk than benefit to the patient in MS imaging. 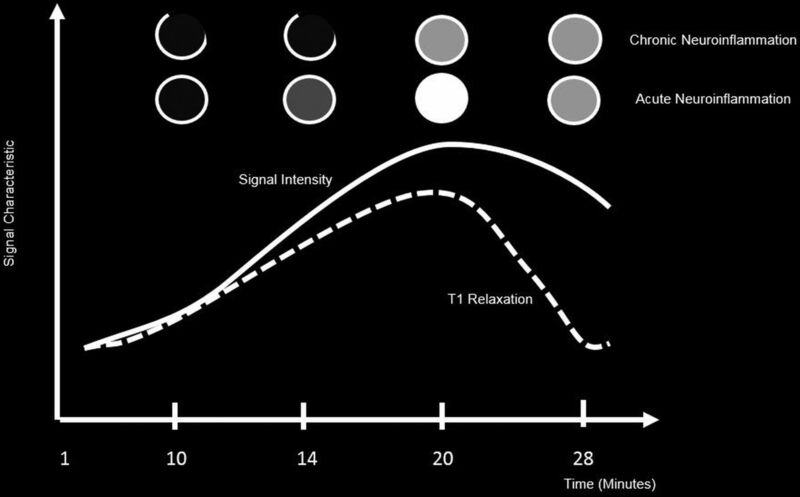 Enhancement patterns of lesions across time depicting signal intensity versus T1 relaxation times of acute and chronic MS lesions. Several studies48,52 have established a correlation between enhancement pattern and the magnetization transfer ratio (MTR). During MTR, magnetization is transferred from the mobile proton pool to the immobile one. The resulting signal density in the mobile pool gives a signal reduction. It allows subcategorization of MS lesions into those with very low MTR such as demyelinating lesions and slightly low MTR as in edematous lesions. Its major advantage is that it is a sensitive parameter to quantify the integrity of myelinated WM (both demyelinated and remyelinated tissue) in the absence of axonal loss.55 Additionally, it has been suggested that the nodular enhancing lesions have the highest MTR, while ringlike enhancing lesions have the lowest MTR. 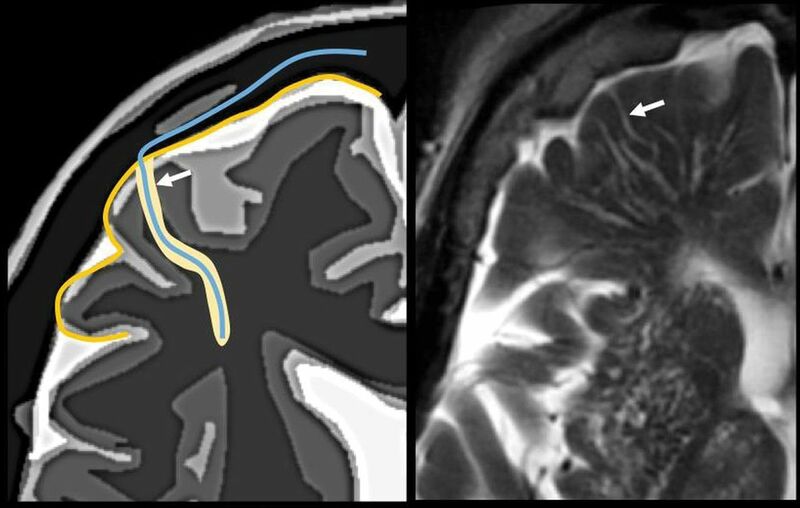 Nevertheless, lesion enhancement can depend on many other factors, including the dosage of contrast agent, the time from injection to imaging, the magnitude of BBB abnormalities, magnetic field strength, concurrent steroid use, and the MR imaging pulse sequence parameters used between each study. One possible mechanism of damage to the WM is through the involvement of a cerebral venule or an arteriole, which provides the blood supply of the parenchyma that depends on the vasculature.56 White matter microvascular disease involves a broad range of conditions such as infection, hypoxia-ischemia, atherosclerosis, granulomatous or nongranulomatous inflammation, among others. Radiologically, it can manifest as focal lesions in the WM or in paravascular spaces. It may have a noninfectious inflammatory etiology (as is the case of MS), an atypical infectious etiology, a metabolic etiology, or a traumatic etiology (diffuse axonal injury). 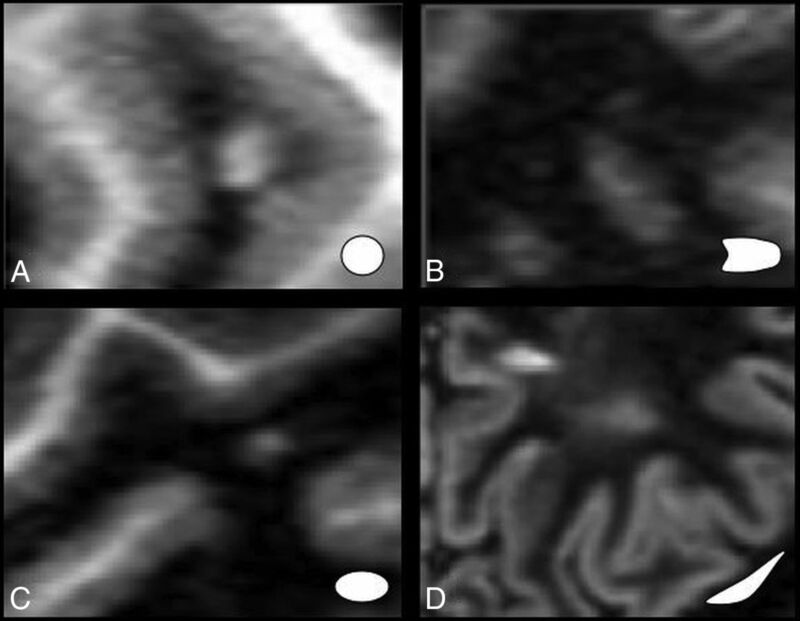 The differential diagnosis of multiple hyperintense punctate images in the white matter on T2-weighted sequences is manifold, and many of these entities must be excluded to make the diagnosis of MS. On the basis of several semiological elements, 3 main patterns can be identified. The first is a vascular pattern, which is caused by an arteriolar lesion and is the most prevalent, seen in the elderly with atherosclerotic risk factors (leukoaraiosis) (Fig 4). The second is a perivascular pattern, which is caused by perivascular inflammation.57 The paradigm of this pattern is MS, for which autoimmune perivenular inflammation has been implicated as the etiology of the demyelination (Fig 5). The third is a nonspecific pattern,58 which is also usually caused by microvascular disease. In the past decade, the focus in MS research has switched from WM to GM involvement.60 Unfortunately, cortical lesions (juxtacortical, intracortical, and subpial GM lesions) remain difficult to detect without high-resolution MR imaging, using a standard field strength. The most likely reason for the difficulty is their relatively small size.61 Moreover, the difference in pathologic substrate, anatomic paucity of myelin in the cortex generating little MR imaging contrast on demyelination, and partial volume effects from adjacent CSF and WM probably play a role. Many in vivo studies have shown improved detection using higher magnetic field strengths up to 7T.62 The implementation of 7T MR imaging has resulted in an increased detection of cortical (enhancing) lesions in patients with MS, compared with the lower 3T and 1.5T MR imaging systems.63 Although the first results with 7T seem promising, several questions still remain to be answered. Morphology, Size, and Changes with Time. Types of lesion patterns: specific (A and B) versus nonspecific (C and D). Localization of an isolated lesion of >10–15 mm is suggestive of a perivascular pattern. Smaller lesions are nonspecific and can be indicative of either a microvascular or a perivascular lesion.56 With time, lesion shape changes from round punctate to oval or fusiform. Meningeal inflammation is rapidly becoming an area of focus in histopathologic findings in multiple sclerosis.64 Meningeal inflammation is a consequence of the long-term disease processes of MS. Recent studies65,66 have found that 3T imaging demonstrated minimal amounts of leptomeningeal enhancement compared with 7T.64 Additionally, there was an association with reduced cortical gray matter volumes, which may represent blood-meningeal barrier breakdown near sites of meningeal inflammation. The perivascular space surrounds the wall of arteries and arterioles and veins and venules communicating with the subarachnoid space along the intraparenchymatous course of the vessels. The superficial or cortical arterioles are surrounded by 1 layer of leptomeninges that separates the vascular surface from the periarteriolar space (Fig 7). The pia mater limits the parenchymal surface of this area. The perivascular space of the penetrating arterioles of the basal ganglia is constrained by the 2 layers of leptomeninges that border their endothelium. There is a direct communication of the superficial and deep perivenular space with the subpial space, with no leptomeningeal layers separating them (Fig 8).67,68 Fortunately, the advent of FLAIR scanning has nearly eliminated any confusion between perivascular spaces which, like CSF, are dark on FLAIR scans, versus MS plaques, which are bright on FLAIR. Only “black holes” of complete myelin loss are dark on FLAIR. Understanding the pathophysiology of lymphocyte-driven inflammation in MS, lesion enhancement patterns, the effect of Gd3+ on the BBB, and the glymphatic system as well as lesion mimics is pivotal in this debilitating autoimmune disease. By understanding the imaging variations that determine the radiologic differential diagnosis, one can make a more accurate and timely diagnosis of MS. These concepts explain the variable appearance of the MS lesions in space and time. Disclosures: David M. Yousem—UNRELATED: Expert Testimony: medicolegal-consulting expert witness; Payment for Lectures Including Service on Speakers Bureaus: American College of Radiology Education Center courses*; Royalties: Elsevier for 5 published books. *Money paid to the institution.
. New breakthroughs involving oligodendrocytes and stems cells, and their impact on multiple sclerosis. Microreviews in Cell and Molecular Biology 2012;1. https://undergradsciencejournals.okstate.edu/index.php/MRCMB/article/view/1987. Accessed February 5, 2018. Accepted after revision June 5, 2018.